Last Sunday afternoon, after the Eco Ride, I participated in a local event to support and share more information about what’s going on in Turkey since 31 May, 2013. 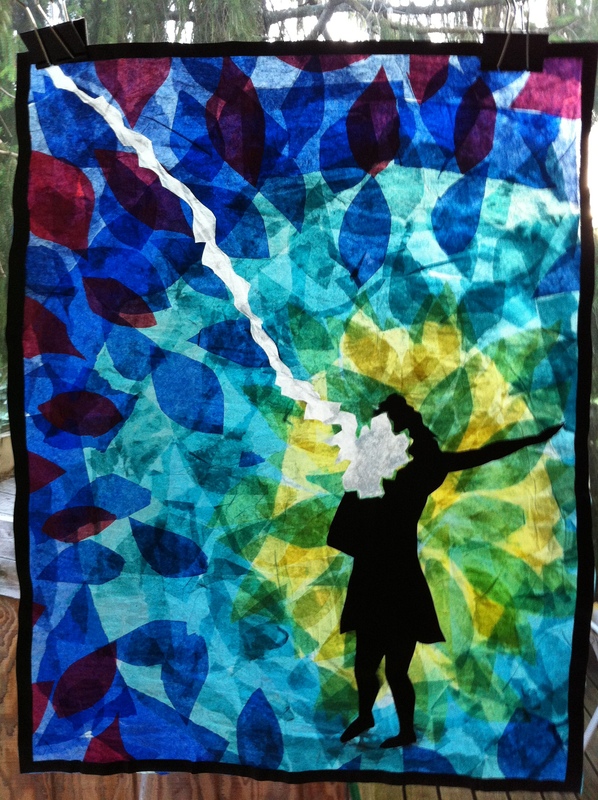 The above is one of two stained-glass-collages (and accompanying stencils) that I made to highlight some of the iconic photographs that came out of the protests. If you are in the area, you can like the organization page on Facebook. If you aren’t local, it is still an interesting page as they review both Turkish and international press and provide some translations and summaries of articles you wouldn’t otherwise see. At first I did not want to directly illustrate any of the violent responses because by showing violent reactions in a beautiful way, it in some way romanticizes that violence. The first drawing that I did was of a couple kissing next to some burning rubble. The love of individuals becoming apparent even in the context of the flames of conflict. Taking artistic liberty, I turned the flames into the leaves of the trees that must now be re-planted in Gezi Park. Seeing choreographed blood and explosions in movies can be exciting, though real blood and real destruction, even from animals killed by the side of the road is disturbing. Part of the reason that works of film are exciting is because they are not real. Things don’t happen that way, and we know it. 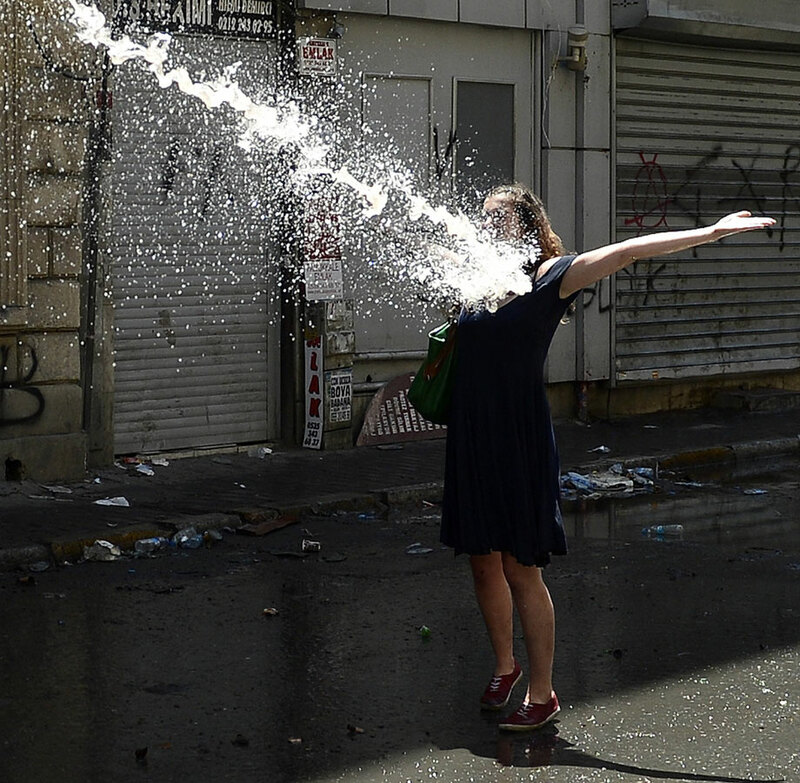 Many of the photos of the violence that has been going on in Taksim Square have been graphic and disempowering. 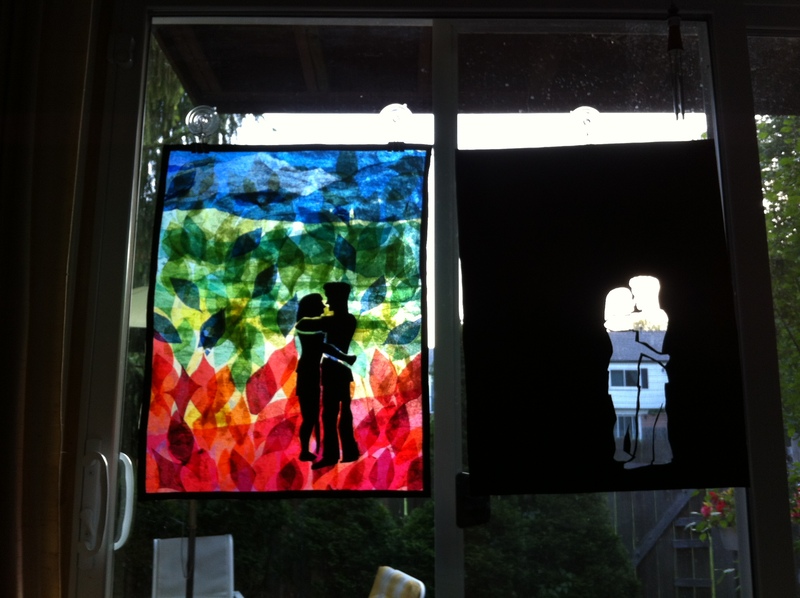 Turning them into stained glass would not show solidarity, it would romanticize the ugliest parts of the goings-on. What changed my mind was this photograph. We cannot see the face of the woman in the original. She could be you, she could be me. She stands, ready to face the impending impact with arms wide as if she is going to hug the water. Powerful like the Nike of Samothrace. Nike, for those who haven’t studied as much art history refers to a personification of Athena as goddess of victory in battle. Unlike some other images, that I won’t post, it does not show the moment when she falls, but rather the moment when her peace faces down the violent onslaught of water. In my version of the image, I made the area surrounding the woman lighter and more green than the rest, hoping to show that out of this moment perhaps new green space and a hard look at the political problems that Turkey faces will grow up. Perhaps this small act of resistance will be a first step into the victory of non-violent protest, spurring political action against corruption. Everyone stumbles sometimes. The last few days, my routine has changed, and with it, my drawings have fallen behind. That isn’t to say that I won’t catch up… Tomorrow I plan on doing a triptych or well a series of 3 drawings. This is based on an afternoon of warm sunbathing with Gracie. The shadows were so pretty with the orange cat and the amaryllis and easter lily shadows. Events of significance: A new table, a new employment, and a new garment rack for my clothes. My little basement studio is looking homey. EXCEPT, I entered my rag-rug in a contest, so the floor feels bare. If you are in the Ann Arbor area, go vote for my rug at Recycle Ann Arbor on Earthday, or thereabouts (Public voting is between 4/22-5/9). Wish me luck!